What could be better when your kids can learn while playing games? Above all playing games for children is always fun. When you add a touch of learning objective while playing a game the child unknowingly achieves his or her learning outcome. That is why educational games are very important. You get the best of both worlds. Knowledge and fun all punched in one activity like your favorite mocktail. There is a common perception in our minds about gaming that it has a negative and detrimental effect on a child’s mental, physical and psychological development. While there is no doubt that staying glued on screen and playing games online would definitely have some negative side effect, nevertheless the positive aspects of gaming cannot be denied. My effort here is to introduce innovative and creative games that are not online and hence do not require many technical gadgets. 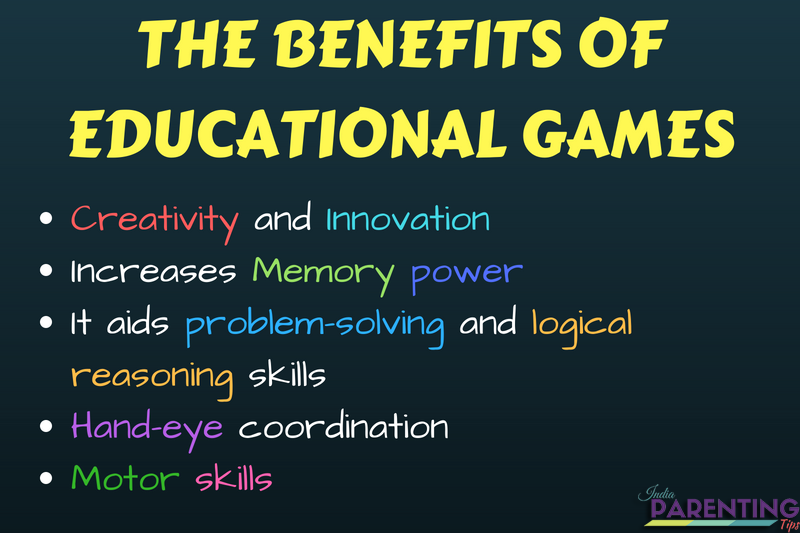 The benefits of learning through play way method are immense. I have personally experienced this after admitting my children in Montessori school which actually follows play way technique teaching important concepts of mathematics, physics, chemistry, biology, social science, and languages. They are creative, innovative and interesting for children to actually do stuff and learn from them. Creativity and Innovation: Educational games fosters creativity and innovation in a child through various actions that ensure an individual’s thought processes and learnings are nurtures. Increases Memory power: While playing various gaming activities which aim at building memory power it helps the child in strengthening his or her memory power and ensures sequential and logical thought processes. It aids problem-solving and logical reasoning skills: Fun learning techniques of game-based educational activities improves logical thinking in children through problem-solving methods. It ensures that the child becomes inquisitive when introduced to new challenges. Hand-eye coordination: Activity-based educational games fosters proper hand-eye coordination for the children helping them to be more independent and alert. 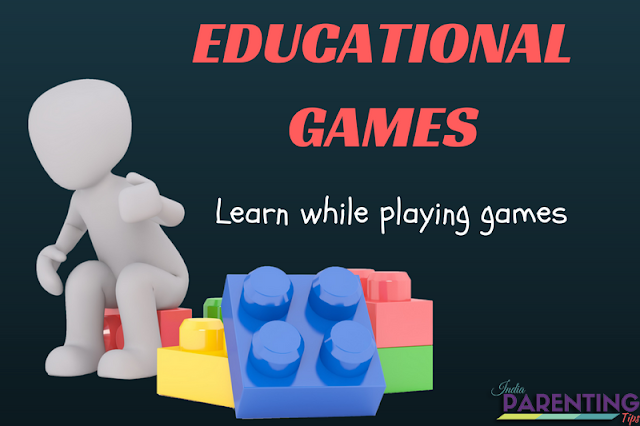 It is extremely helpful for Children with special needs, Attention Deficit hyperactive disorder children (ADHD), Dyslexia children and those who are Autistic and important skills can easily be developed through educational games. Motor skills: Educational games are great ways to develop fine motor skills for the children. Some of the basic motor skills like clapping hands, building different blocks, puzzles, cutting and pasting things etc are great ways to develop a child’s motor skills in the initial days. Educational games can be cheap and best. It is a big mistake to think that educational games are expensive and only when they are expensive they serve the right purpose. Nowadays most of the fun learning gaming companies are trying to lure the parents to buy expensive, genuine items known as educational toys. While there is no doubt that these toys are very good in serving the purpose of learning through play way method, however, It should be known to parents that it is a matter of choice for them. If they can afford they can go ahead and buy them. On the other hand, if finance is a concern especially for the middle class and lower-middle-class families, the same purpose can be served with cheap and best learning activities. My aim here is to open doors for parents who find it difficult to buy expensive educational learning tools and gaming techniques. In my article, I plan to introduce a new, creative fun learning technique that can also get your children involved in a family activity. So get on your seat belt and get ready for some cool leaning gaming tips. 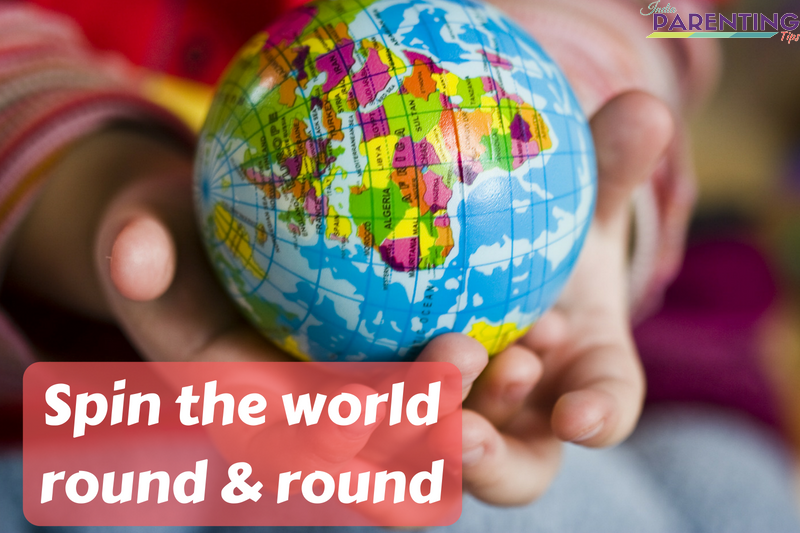 This is a fun learning game for teaching kids about the world around them enabling them to know different countries, capitals, continents, and waterbodies. Aim: To enable children to learn Social Studies lesson on World, Countries, States, and Capital, Water bodies, Continents, counting and learning tables, framing sentences and knowing about nouns. What you need: a Globe, a paper, a pencil. How to play: Each child is asked to spin the globe closing the eyes. Then he or she is supposed to touch the globe with one finger. Other children are asked to talk about that place through clues and the child would need to guess the name of the country, capital, continent, waterbodies what he or she has pointed. How to calculate the score: At the end of the game, let the children count the points scored in multiples of 2, 3, 4, 5, 6, 7, 8, 9 as points depending on your choice that you would like the tables to be learned. That would also help them to learn tables. Learning outcome: Knowledge about the countries, continents, waterbodies; Knowing to count, tables. Subject Covered: It’s a part of integrated learning. So the subject covered would be Social Studies for knowing about the world, countries and how to use globe; Mathematics, as the children are asked to count the scored in multiples like table of 2,3,4,5,6,7,8 or 9; English as the children, are asked to frame sentences and talk about the particular noun by framing sentences of their own. This is a memory game helping children to recall, articulate and enact actions that would enable children to develop strong memory power and know more about actions and verbs. 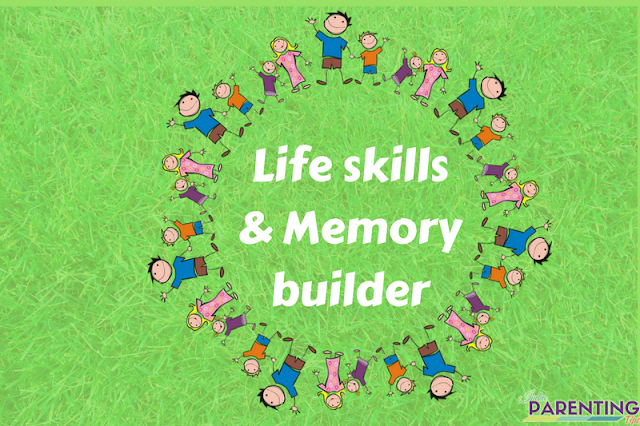 Aim: To enable children to develop and strengthen memory skills and actions. The children would enjoy imitating actions and recalling names for their friends in a fun way. What you need: Children 4 or more to play the game. The more the better. Even other family members can join the child in case more children are not available. How to play: The children are asked to stand in circles holding hands. Each is asked to introduce himself or herself with his or her name and one action for himself or herself. The second child is supposed to say the first child’s name, actions and then introduce himself or herself in the same way. This way it would be fun in doing actions and memorizing names as well. Learning Outcome: The game would help children in building memory power, fun activity to learn about actions and verbs. Subject Covered: Mental ability, English (learning about actions) This activity can be a warm-up activity to introduce children to learning action words, verbs. 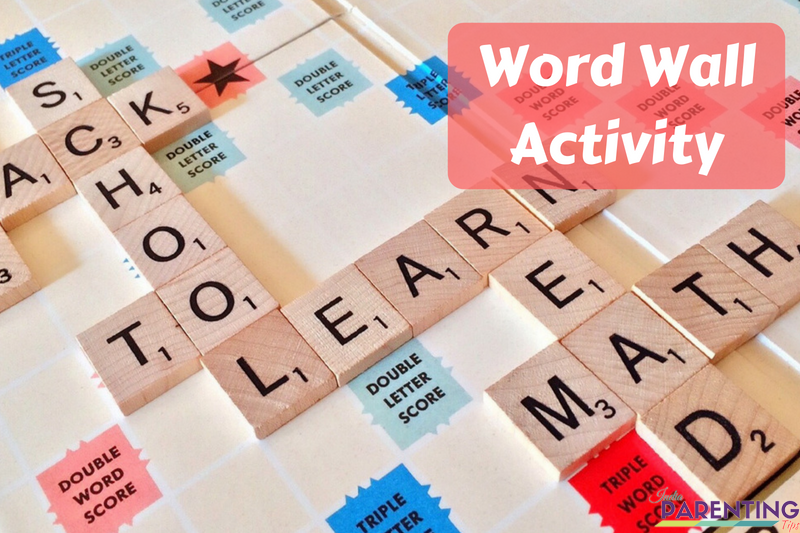 This is a very cool interesting activity to introduce children to new words building vocabulary, synonyms as well as antonyms. Aim: To enable children to develop vocabulary skills, word power, and linguistic skills. What you need: A chart paper, alphabet stickers, color pencils, glue. How to play: Each child is given new words as chits of papers and asked to find its similar meaning. This way they get to know about the word. The child is given a phone with dictionary app or a dictionary whichever is easier for the child to get the right meaning. Nowadays even in Google assistance one can call out the word and get the meaning. After knowing the meaning, the child needs to write the word and meaning on the colored paper and draw what he or she can understand. When you tell the child to draw the word, he or she would get the right meaning and would always remember it. Following this, he or she is asked to write the opposite word for the given word. Whoever is able to finish all the activities is declared as first and gets a prize as a token of appreciation. Learning outcome: vocabulary building, synonyms, antonyms, creative learning, and drawing. Teach the basic concepts of subjects and predicate games to children by playing simple matching games. Aim: To develop a proper understanding of the subject & predicate through gaming activity. What you need: You need some colored papers or cardboard papers. Color pencils, scissors, board pins in case you have a soft board or chart paper to stick on the walls. How to play: Children are divided into two groups. One group is given Subject words and the other group is given predicate words. The pair that completes a proper sentence matching subjects and predicate scores first. Learning Outcome: learning English grammar on Subject and Predicate. Activity which involves physical action and fast thinking which creates alertness and promptness in children. The activities discussed above are neither computer-based gaming nor expensive stuff that we need to procure from the market. These are absolutely fun-filled home-based educational games for children to enjoy learning things based on activities. All that is required is time and your thought process that would help to create similar activity-based learning techniques for your child. Above all parents are the best teachers and you know best your child’s need and skill.